Here is a list of frequently asked Challenge-related questions. If you can’t find the answer to your question below, please write to contest@circuitcellar.com. You are challenged to design and build an innovative project that uses least one WIZnet WIZ550io Ethernet controller module or W5500 chip. You can use any other MCU and/or module along with the WIZ550io Ethernet module. Visit the Eligible Parts webpage for more information. Build and thoroughly document a project featuring a WIZnet WIZ550io Ethernet Controller module or W5500 chip. Register for the Challenge and obtain a Project Registration Number. Submit a complete project Entry. WIZnet is the Sponsor. Elektor International Media/Circuit Cellar is the Administrator. I am not a U.S. resident. May I enter the Challenge? Yes. 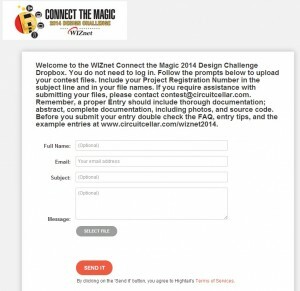 The WIZnet Connect the Magic 2014 Design Challenge is open to anyone who is in possession of a WIZ550io module or W5500 chip and who meets the eligibility requirements. However, foreign entrants are cautioned to review the laws in the country or province in which they reside to determine if they are prohibited from participating. This Challenge is void where prohibited by law. May I submit a project that I submitted to a previous design contest from Elektor, Circuit Cellar, or others? Technically, yes. However, you must comply with the official rules of this Challenge. If you submit a project that you submitted previously, we strongly advise you to modify your original project by improving it and truly demonstrating how it benefits from the use of WIZnet’s WIZ550io Ethernet controller module. When the Challenge concludes, we will select a number of entries to post at circuitcellar.com/wiznet2014. The uniqueness of a project will be a key factor in this decision. We may be less inclined to select a project that is exactly the same as a project that has been posted for a previous contest. I work for a major distributor that sells WIZnet components. Am I eligible to enter the Challenge? According to the Rules, you are still eligible to enter. But, if you have any doubts, please e-mail contest@circuitcellar.com and we will ask WIZnet for a ruling. Direct employees of Elektor, Circuit Cellar, and WIZnet and their subsidiaries, their advertising, promotion, and production agencies, as well as members of their immediate families, are ineligible. Will the Sponsor or Administrator own the intellectual property rights to my contest entry? No. The design remains the intellectual property of the Participant, subject to the license grants for prize-winning entries and exceptional entries as set forth in the rules. Such license grants pertain to the Sponsor and Administrator’s non-exclusive publishing rights to the contest entry material of winners and exceptional entries without limitation. We encourage all Participants to seek patents for any unique or proprietary aspects of their design prior to submission. Ultimately, you’re always still in control of your intellectual property. Even after your project is posted, if some manufacturer approaches you about putting your design into volume production, you still own all the IP rights and they can only negotiate with you. Believe us when we tell you that WIZnet would like nothing better than to know that a dozen project entries became volume commercial products using WIZnet devices. The free enterprise system is the best way to achieve that goal. If I submit a project that becomes a winner or is designated as exceptional, does it have to be posted? Yes and no. There are contest rules that tell you how things will be happening, but it doesn’t end there. We have a separate and specific eligibility and publishing agreement that must be signed by each winner or Distinctive Excellence designee, which is a final chance to decide if the benefits of the contest publicity or the prize money are still greater than doing something else with the project. Our contests are all about mating an exceptional device with exceptional design talents. We want you to feel that you can design a commercial-grade product and submit it to this contest without losing control of it later if you choose otherwise. If you win or receive Distinctive Excellence, you still get to decide that the contest publicity is going to do more to promote your abilities or product design than other methods. With the exception of the publishable project abstract described in the rules, your full project entry materials are treated as proprietary materials by the Administrator and the judges. Except for the Administrator staff and the judging team, no one, including the sponsor, sees your full entry unless you have signed the Eligibility and Publishing Agreement after the contest judging. What happens to my project if it’s not selected as a winner or for additional posting opportunities through Elektor and/or Circuit Cellar? 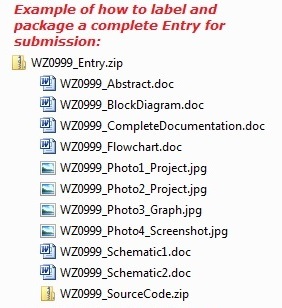 In a case where the Administrator and WIZnet don’t offer a Distinctive Excellence or winner’s posting agreement to a Participant, or they don’t receive a signed agreement from the Participant who was sent an agreement, the Administrator deletes the full project entry materials from the contest archives. However, as stated in the Rules, the Administrator and WIZnet still retain the right to publicly show the Project’s abstract. This is why it is highly recommended that Participants create their own abstracts. By creating, clearly specifying, and submitting your own abstract, you also maintain control over how much overall project detail you want circulated without first knowing that your project is among the contest winners or a Administrator Distinctive Excellence candidate. Who sees my contest Entry and do they sign nondisclosure agreements? Yes, everyone handling your contest Entry is bound by a nondisclosure agreement. The design contest is fully administered by Administrator staff. This means that when you submit a contest Entry, your project files will be assembled by in-house editors and packaged for final presentation to the contest judges. The judges are independent professionals. They all sign nondisclosure agreements. Your contest Entry is not transmitted to anyone other than internal Administrator editorial staff and the judges until your project is designated to be an official prize winner or distinctive excellence award winner and you sign a separate agreement giving the Administrator and the Sponsor nonexclusive publishing rights as described in the rules. Even after signing this agreement, you still own the Intellectual Property. Any projects not designated as winners or Distinctive Excellence awards are deleted from our archives after the contest. Do I have to register for the Challenge? Yes. Complete a Project Registration Form to receive your Project Registration Number, which you must use to label your Project Entry in preparation for judging. Project Entries, clearly marked with your Project Registration Number, must be submitted by 12:00 PM EST on August 3, 2014. Do not label your Entry with your name. Use only your Project Registration Number. Registration is required by the Entry Deadline. When I register for the Challenge, will I automatically be entered to receive a free sample WIZ550io module? No. If you want to request a free WIZ550io sample, you must fill out the Sample Request form. Supplies are limited. What is a Project Registration Number? A project Registration Number is a number (for example, WZ1001) that you will receive after registering your project for the Challenge. This Registration Number should be used to label your entry. Complete a Registration Form for each Entry you submit. May I include my name in my entry materials? No. Do NOT put your name on any materials that will be judged. Your name should not appear on your abstract, complete documentation, schematic, photograph, block diagram, other diagrams, or code files. Use your Project Registration Number to label these files. May I include my name in the e-mails I send to contest@circuitcellar.com? Yes. The Administrator staffers are the only people who will see your e-mails. The judges will not see your e-mails. The judges will only see your Entry materials. Please DO include your name in all correspondence with us. Also, please include your project Registration Number in the subject line of all correspondence with us. If I’m working with co-designers, does each of us need to register? No. One person should Register for the group. After registering, you will receive one Project Registration Number to label your Entry. If I’m entering more than one project in the Challenge, do I need more than one Project Registration Number? Yes. Each Entry must have a separate Project Registration Number. Fill out a Project Registration Form for each project you intend to submit. Can I use third-party commercial software, third-party commercial boards, or WIZnet development systems with my Challenge Entry? You may use such items as long as you clearly identify them and everything you include in your project documentation and software is allowed in the third-party license. The “ownership” and “original development” language in the rules as it pertains to your contest Entry does not apply to this third-party material. We recommend that you redraw the schematic of any commercial product in order to highlight your hardware circuitry. Your photograph should show your actual hardware, even if you use a commercial development system. E-mail contest@circuitcellar.com if you have any questions. Can I use commercial code? Yes, in some cases. The majority of your source code should not come from a commercial source though. If you use commercial code, you must specify the product you used, the manufacturer/supplier, and which parts of your code are commercial. You cannot use commercial code if the manufacturer/supplier prohibits the posting of the code that you include with your Entry. You cannot use commercial code if you are not allowed to use the commercial run-time libraries and shareware in your Entry. How do I request a free WIZnet WIZ550io module? The WIZnet Connect the Magic 2014 Design Challenge is open to anyone who is in possession of a WIZ550io module or W5500 chip and who meets the eligibility requirements. If you want to request a complimentary WIZ550io module, you must fill out the Sample Request form. Samples will be given to eligible participants on a first come, first serve basis while supplies last. When I register for the Challenge, will I automatically receive a free WIZnet WIZ550io module? No. If you want to request a kit sample, you must fill out the Sample Request form. Samples will be given to eligible participants on a first-come, first-served basis while supplies last. Is the Challenge sample module free? Do I have to pay shipping and handling costs? The WIZnet WIZ550io module is free to eligible Challenge participants while supplies last. Shipping and handling are free. However, the recipient is responsible for all duties and taxes associated with the shipment. 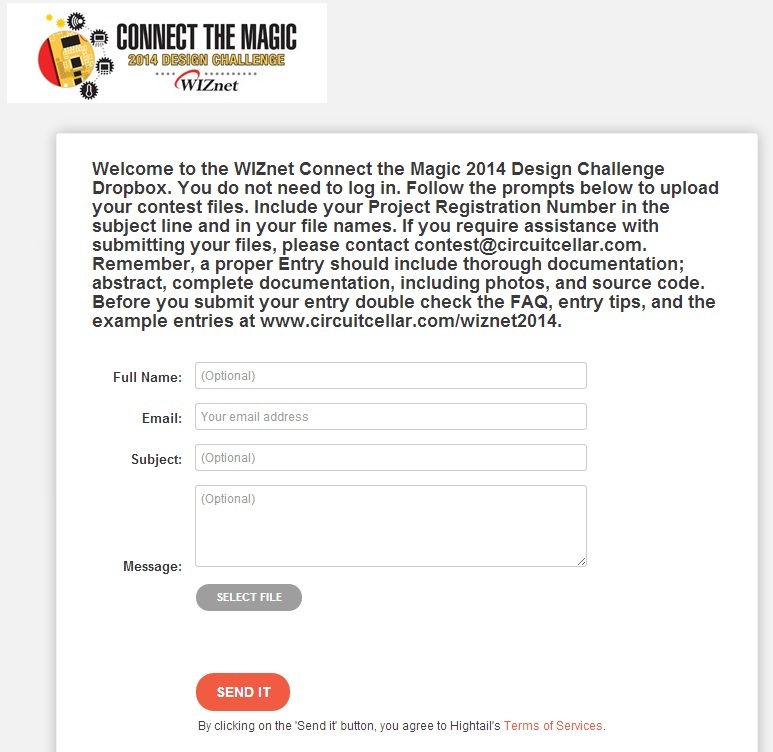 You enter the WIZnet Connect the Magic 2014 Design Challenge by uploading your project via the Entry page, using the Challenge Dropbox. The term “Entry” refers to your Abstract, Complete Documentation, and Code collectively (preferably compiled all together in one ZIP file). Your Entry must be labeled with your Project Registration Number and submitted by 12:00 PM EST on August 3, 2014, for your entry to be considered complete. Label your Entry files with your Project Registration Number. Your Entry must include certain materials to be deemed eligible for judging. Once you create your entry, you can Enter via the Entry page. Why should I provide an abstract with my Entry if the Challenge rules state that the Administrator can create one on my behalf? It is assumed that nobody knows the details and value of your Challenge entry as well as you do. It is to your advantage to make sure your project’s highlights are included in an abstract that you submit with your entry. By creating, clearly specifying, and submitting your own abstract, you also maintain control over how much overall project detail you want circulated without first knowing that your project is among the contest winners or a Distinctive Excellence candidate. However, realize that unless that detail includes all the necessary ingredients of a legitimate abstract, the Administrator may still extract the missing ingredients from the project entry to construct it. Please use common file formats that are easily accessible. The formats below are preferred. Video files are also encouraged (but not required) so you may further demonstrate the capabilities of your entry. What should I feature in the project photograph? What file formats are acceptable? Your project photograph should show your complete project. See file formats in the answer above. If you embed your photograph in a text file, you must also include a separate file. High-resolution (around 300 dpi) images that are approximately 4 × 4 inches are preferred. Please do not resize or manipulate the photograph in any other way. Are there file size limitations? The Challenge Dropbox can accept files up to 2 GB. You may use this page as many times as needed to send additional files. Be certain to clearly identify your Project Registration Number. Can I see an example of a proper Challenge Entry? Yes. Here are two example entries. These Entries (from a previous challenge) meet the guidelines. Follow the instructions posted on the Entry Page. To upload your files, use the Challenge Dropbox. Go to the Entry Page and upload your file(s). 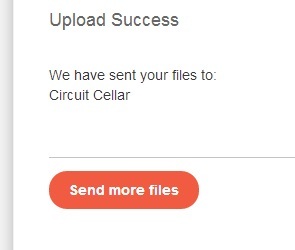 If you absolutely cannot use this Entry Page upload process, you can e-mail your Entry to contest@circuitcellar.com or send a CD-ROM, DVD, or USB stick via mail to the address below. Mailed entries must be postmarked no later than 12:00 PM EST on August 3, 2014. Label everything (e-mail subject line, all files, etc.) with your Project Registration Number. When should I send in my Entry? You can submit an Entry any time between the Challenge launch on March 3, 2014 and the Entry Deadline of 12:00 PM EST on August 3, 2014. All Entries must be received on or before 12:00 PM EST on August 3, 2014. Entries received or postmarked after 12:00 PM EST on August 3, 2014 are ineligible. It makes sense to submit your Entry early. If you submit your entry at least a few business days prior to the Entry Deadline, you’ll give us time to check for corrupt files and missing elements. If your ZIP won’t open, for example, we will have time to e-mail you so you can send a replacement by the Entry Deadline. Can I e-mail or mail my digital Entry? We prefer to receive digital files via the Entry page upload process, using the Challenge Dropbox. Please use the upload procedure. Will I receive confirmation when my entry is received? Yes. If you properly upload your Entry via the Entry Dropbox, you should receive digital confirmation. If you e-mail or mail your Entry, you should receive confirmation from the Administrator. Tip: If you want to ensure that you receive confirmation prior to the Entry Deadline, submit your Entry early. As you can imagine, we’ll be busy at the end of the Challenge. Turnaround time for confirmation will be faster if you submit your entry at least a few business days before the Entry Deadline. How do I put together an Entry that will impress the judges? Provide thorough documentation of your project. Organize your Entry so it’s easy for the judges to find everything. Winners will be notified via e-mail or postal mail on or about September 5, 2014. The list of winners will be posted at www.circuitcellar.com/wiznet2014. If I win and have to send in my finished project, will it be returned? Yes. If you are chosen as a winner, you might be required to ship your project to us for evaluation. Your project will be returned to you. What is required of a winner? All winners will be required to sign an affidavit of eligibility and release of liability prior to being declared a winner. All winners are required to comply with all reasonable requests for tax identification and will be required to provide a Social Security number (U.S. residents only) before receiving any prize. All properly claimed prizes will be awarded. Only the prizes specified in the numbers indicated will be awarded. Total cash value of Challenge prizes is approximately $15,000. Are there other opportunities besides the Challenge prizes? Sure! Elektor and Circuit Cellar traditionally designate additional noteworthy project entries in their own special contest category called Distinctive Excellence. These projects are posted alongside the winning entries and typically receive the same publicity as the official contest winners. This is a great opportunity for you to get noticed in the field and be recognized for your design skills. Don’t worry; we’ll contact you prior to publishing any of your project details to confirm you accept the honor. Plus, we’re always looking for new articles for Circuit Cellar and Elektor magazines. If you design a great application, we may contact you about writing an article. Here are examples of Distinctive Excellence presentations from a previous challenge. Additionally, we’re always looking for new articles for Elektor magazine and Circuit Cellar magazine. If you design a great application, we may contact you about converting your project into a published article in the magazine.